So … I assume, to sail, you have to know how to tie a bunch of knots. Big, thick, heavy ones, used to swing the rope around your head like a lasso and launch it out to save a drowning deck hand, as well as small, quick, handy ones, that you can tie in less than two seconds flat and throw your hands up in the air when you’re done – like hog-tying a steer. (For the head-scratchers: http://youtu.be/7t6-LRJ_JRc. And, I hope you didn’t miss the commentary at the end “These are some fresh, lost, wee-looking little kicking boogers here today!” Good stuff). But – back to the wold of sailing. Someone shouts “Grab that line and tie a monkey’s fist in it!” and I should know what to do, right? Right. Of course! Any sailor worth his salt would. So, Phillip and I decide one night to delve into the wonderful world of knot-tying. This is knot (pun intended) the most entertaining way to spend the evening, I can assure you, but it does pair well with a glass or two of wine. Three at most. After that, you begin to lose dexterity and cognitive function and find the next day that you got a little too creative with shoelaces, apron strings, and any other tie-able things around the house that cannot now be un-tied. Trust me; I speak from experience. So … knot tying. I recommend mastering the bowline. 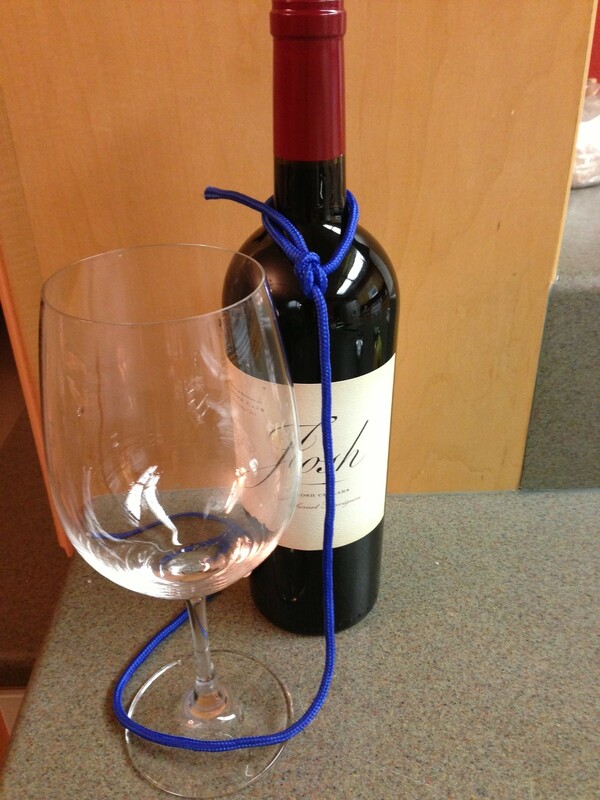 It’s a simple, easy knot, that holds tight but is easy to break free, and it can be taught in all of two minutes (three post-wine). A cleat hitch, used to fasten lines securely to cleats on the boat or dock, is also a must. A figure eight is also great to stop a line from running through a pulley, and the clove hitch is a given to tie the boat to a piling. There are many more knots you could spend hours learning, but I’m assured there are only a handful you will really need on the boat. As for the other 800 fancy ones you could spend hours mastering, you’re likely to completely forget them anyway when you-know-what hits the fan and there’s even a remote chance they would come in handy. In all, I recommend spending an evening with a good knot-tying book and some string to conquer the basics. And, while I recommend pairing many things with wine (because, let’s face it, it just makes everything better), in this case you’ll find the bottle (a full one, so drink slowly!) serves as a good wrap-around base to practice the essentials. Like the bowline shown below! Master them on land, and you’ll be a whiz at them on the boat. There will also be many other skills to practice and pick up along the way – splicing, for one. But, that’s another post for a nicer day. You’ll need to suffer a few knotty ones first, so get to it! Cheers! This entry was posted in Sail Skills and tagged bosun skills, bowline, bowline knot, clove hitch, knot-tying, monkey's fist. Bookmark the permalink. Next time video the knot tying, after the three glasses of wine of course!